It’s hard to believe, but the Obama administration recently selected Chevron, the San Ramon-based corporate giant known for environmental destruction and the violation of human rights throughout the world, as a finalist for its “corporate excellence” award! “Chevron in Burma assisted local communities in 1,500 villages through its sustainable health improvement and empowerment program by providing funding to villagers for improvements in business, transmittable disease prevention (TB/malaria), agricultural practices, and infrastructure. The company’s entrepreneurial programs have also empowered more than 8,000 women to start-up and operate their own businesses, “ the release states. In fact, CREDO Action became so upset with the State’s Department’s “honoring” of Chevron that they circulated an on line petition to stop the administration from honoring Chevron. “The State Department will be announcing the winner of its corporate excellence award on Tuesday, so we need to act fast to make sure Chevron doesn’t receive this grossly undeserved honor from the U.S. government,” said Josh Nelson, Campaign Manager of CREDO Action from Working Assets. Fortunately, the State Department didn’t pick Chevron as one of the three winners of the award on December 9. “We organized a big letter with 30 NGOs signing on and a petition to oppose the award and fortunately Chevron lost today,” said Paul Paz y Miño of Amazon Watch. Instead, Under Secretary of State for Economic Growth, Energy, and the Environment Catherine Novelli presented the Secretary of State’s 2014 Award for Corporate Excellence (ACE) to EcoPlanet Bamboo Group in Nicaragua, Wagner Asia Equipment, LLC in Mongolia, and The Coca-Cola Company in the Philippines. “The annual award recognizes U.S.-owned businesses that play vital roles around the world as good corporate citizens in supporting sustainable development, respect for human and labor rights, environmental protection, open markets, transparency, and other democratic values,” according to a news release from the State Department. Unfortunately, one of the three awardees, the Coca-Cola Company, is just as infamous as Chevron for its environmentally destructive operations and violation of human and labor rights throughout the world, stretching from its plants in Columbia and Guatemala to those in India and throughout Asia. The State Department’s selection of big environmental destroyers and human rights violators like Chevron and Coca-Cola as finalists and/or winners of these awards is one just another example of the power and influence that big corporations exert over the U.S. government. “Honoring Chevron with the Secretary’s Award for Corporate Excellence would send a dangerous signal to other corporations that there are no consequences for egregious human rights and environmental violations,” said Nelson, prior to the State Department choosing the 3 winners from the 9 finalists. “Burma may be one of the most egregious examples of Chevron’s disregard for human life and our planet, but wherever Chevron does business – from California to countries like Ecuador, Nigeria and Kazakhstan – local residents and the environment pay the consequences in the form of dangerously polluted water and toxic air emissions,” he said. In Richmond, California, where Chevron has been repeatedly cited for safety and regulatory violations, a huge fire at the company’s century-old refinery sent more than 15,000 local residents to hospitals with respiratory issues and other health problems, according to Nelson. In Ecuador, local residents filed a class action lawsuit against Chevron for illegally dumping 18 billion gallons of polluted water into rivers in the Amazonian rainforest. 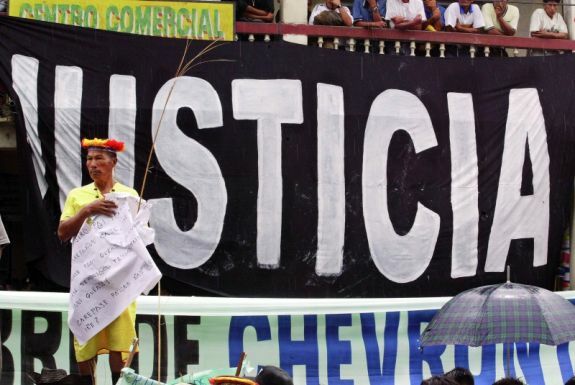 Chevron has been found guilty by Ecuadorian courts and ordered to pay $9.5 billion. The company is now running from an “international legal dragnet” to force the company to pay for the vast task of cleanup and remediation of the Ecuadorian Amazon jungle, the group said. In Nigeria, local villagers sued Chevron for its highly-polluting practice of flaring – or burning off – excess natural gas at its oil drilling operations. “These fires do not help us; they do not make crops grow or improve our health. In fact, it is the opposite. They destroy both our health and our environment,” the counsel for the plaintiff explained after the case was settled for an undisclosed sum. These egregious human rights and environmental violations take place in the context of the dramatically increasing power of Chevron, the Western States Petroleum Association (WSPA), and the oil industry in California and the U.S. The oil industry has spent over $70 million on lobbyists in California since January 2009, including record amounts of money spent during the third quarter of 2014, according to a new report written by Will Barrett, the Senior Policy Analyst for the American Lung Association in California. Chevron was second only to the Western States Petroleum Association (WSPA) in oil industry spending on lobbyists since 2009 with a total of $15,542,565 spent. WSPA, the most powerful corporate lobbying organization in Sacramento, established to lobby for Chevron and other big oil companies, topped Chevron’s own lobbying expenses with a total of $31,179,039 spent on lobbying since January 1, 2009. From July 1 to September 30 alone, the oil industry spent an unprecedented $7.1 million lobbying elected officials in California “with a major focus on getting oil companies out of a major clean air regulation,” said Barrett. The oil industry spending total from July through Sept 2014 amounts to an amazing $2.4 million/month, $78,000/day, $3,200/hour, $54/minute and $1/second! And this doesn’t include spending on ballot measures or the recent election, including Chevron spending $3 million (unsuccessfully!) to elect “their” candidates to the Richmond City Council. Big Oil also dumped $7.6 million into defeating a measure calling for a fracking ban in Santa Barbara County and nearly $2 million into an unsuccessful campaign to defeat a measure banning fracking and other extreme oil extraction techniques in San Benito County. Nor does this include how the oil industry exerts its enormous power and influence by working its way into state and federal regulatory panels. In one of the most overt conflicts of interest in California history, Catherine Reheis-Boyd, President of the Western States Petroleum Association, actually CHAIRED the Marine Life Protection Act (MLPA) Blue Ribbon Task Force to create fake “marine protected areas” on the South Coast, as well as serving on the task forces for the Central Coast, North Central Coast and North Coast from 2004 to 2012. It gets worse! In addition to spending massive millions on lobbying and political campaigns and serving on state and federal regulatory panels, Big Oil’s lobbying organization, the Western States Petroleum Association, has funded and set up a network of “Astroturf” groups to oppose California’s environmental laws. This network was revealed in a leaked powerpoint presentation from a Nov. 11 presentation to the Washington Research Council, given by the same Catherine Reheis-Boyd who oversaw the creation of so-called “marine protected areas” on the South Coast! “Specifically, the deck from a presentation by WSPA President Catherine Reheis-Boyd lays out the construction of what environmentalists contend is an elaborate ‘astroturf campaign.’ Groups with names such as Oregon Climate Change Campaign, Washington Consumers for Sound Fuel Policy, and AB 32 Implementation Group are made to look and sound like grassroots citizen-activists while promoting oil industry priorities and actually working against the implementation of AB 32,” the group said. Unfortunately, not one of the “reporters” who covered the WSPA “Astroturf” scandal mentioned the even bigger scandal of how the same oil industry lobbyist who delivered the Powerpoint presentation oversaw the creation of fake “marine protected areas” in Southern California, in collaboration with state officials and corporate “environmental” NGOs. These alleged “marine protected areas” fail to protect the ocean from fracking, offshore oil drilling, pollution, corporate aquaculture, military testing and all human impacts other than fishing and gathering. People need to understand that the millions Chevron and other oil companies have spent on lobbying, campaign contributions and setting up “Astroturf” groups promoting the oil industry agenda are small change to Big Oil. The five big oil companies – BP, Chevron, Conoco-Phillips, Exxon Mobil and Shell – made a combined total of $93 billion in profits last year. Big Oil’s estimated profits in 2014 to date are over $87 billion. When will the CIA win Best of Show at the Westminster Kennel Club Show? When will George W. Bush be awarded Mr. Congenial at the Mr. America competition? Zippy the Pinhead for President. Chevron is listed by Corporate Accountability’s corporate hall of shame 2014 as one of the top contenders. Thanks for writing this informative piece, Dan.